ROCKiT space would like to recognize the generous efforts of our neighbors and partners City Fruit and Jose Rizal Park Orchard for picking and delivering 300 pounds of apples to Garden House! These little beauties will be pressed into cider at the Beacon Hill Harvest Fair October 22. The cider will be shared with neighbors who attend the event. Folks should bring clean jars or containers to take some home! The Harvest Fair will run from 2-9 p.m. on October 22 at the Garden House, 2336 15th Ave. S. Stay tuned for more information later this week! 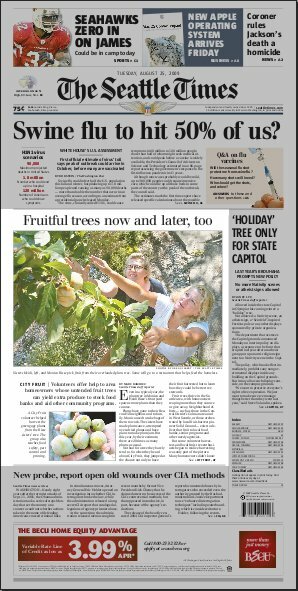 Nearly half the front page is devoted to the Risses' plum tree. From the Seattle Times front page PDF. Heidi Risse pointed out their plum tree’s front-page appearance on today’s issue of the Seattle Times. The Risses’ tree, with a bumper crop of plums this year, is featured in an article about City Fruit (previously mentioned here), an organization formed earlier this year to not only help harvest urban crops, but to assist and educate tree owners in pest control, pruning and processing. Check out City Fruit’s calendar for classes on canning and more. Find out how the 75 pounds of bounty will be put to use in the article at the Times.